If you’ve been exploring web hosting services for a considerably long time, you’ll notice that they all seem to look the same one way or another. They’ll just add one or two unique features, scale down or scale up the price, and voila – you’ll get a web hosting package that “you won’t find in any other web host”. Will you fall for such cheap tricks? The best thing you need to do before signing up with a web host is to dig deeper into their features and services, and uncover everything you need to know about them. Netfirms is one such web host that’s been making a buzz lately. But is it because it’s a reliable web host, or is it notorious for ripping off customers with sub-par services? Well, that’s exactly what we’re going to find out in this Netfirms in-depth web hosting review! This review aims to help you understand whether or not this web host is great for hosting a personal or business website. Will it let you build a website in just minutes, or should you just move on to a better web hosting provider? Let’s find out! Netfirms Web Hosting: What’s Their Story? Netfirms have been in the web hosting business since 1998, building a solid reputation for providing affordable and reliable hosting solutions. They are owned by one of the giants in the web hosting industry, Endurance International Group (EIG). The same company owns many other hosting providers, including Hostgator, FatCow, JustHost, and BlueHost – all of which are top brands in the market. Netfirms primarily focus on catering to individuals and small businesses; with the goal to provide top-notch services at affordable rates, and to help their clients get their ideas online. Today, they are hosting more than 1.2 million client websites, with hundreds of thousands of clients from around the world. Who doesn’t want to go for a web host that’s guided by such strong principles? Netfirms currently offer a number of web hosting services, include shared hosting and VPS hosting. Each of their plans is designed to meet the specific needs of various clients. Like most web hosting providers, they offer a set of features that starts out pretty basic and goes up as you choose a more advanced hosting package. All of their hosting plans offer unlimited disk space and bandwidth, however, which is good. And if you commit with them for a year or more, you’ll get to pay for the plan at a much cheaper price. Whether you’re an individual, a startup business, or a growing enterprise, Netfirms have the solution to your web hosting needs. And it’s not just any solution, it’s one that you can rely on for your specific needs – and without having to break the bank, too! Starting from a special introductory price of $3.49 a month, you can get a feature-packed shared hosting plan to get your site up and running fast. You can choose from three different packages: Plus, Advantage, and Business. The price gets cheaper for 1-year, 2-year, and 3-year plans. At $3.49 a month, you can get the Plus plan for building a simple blog or business website. It comes with the necessary tools for creating your own space in the web, one that’s uniquely yours. It’s perfect for beginners and those who are on a tight budget. The package already comes packed with a Drag-and-Drop Site Builder, pre-designed website layouts, a photo gallery software, FREE search engine marketing and ads credits, and more. Looking to build a website that can connect you with your customers? Netfirms’ Advantage plan is a great way to get on, as it allows you to showcase your products and services online, send professional emails, and more. It’s the ideal solution for small and medium companies looking to strengthen their Web presence. The Advantage plan has all the tools and options you need to leverage your brand online, in the fastest and most convenient way possible. The plan comes packed with a Drag-and-Drop Site Builder, pre-made templates, SimpleScripts one-click installer, search engine marketing and ads credits, plus the exclusive Netfirms Clustered Hosting Technology. The latter helps you handle sudden traffic spikes to your sites so there are fewer disruptions. It’s a premium tool for large e-business, but with Netfirms, it’s a standard feature in all their hosting plans. Last but not the least is the Business plan, which starts at $10.99 per month. It’s perfect for those who’s already made a mark with their business, and want to extend their reach to the World Wide Web. So whether it’s for expanding your customer base or launching an online store, trust that this hosting plan can help you with its collection of powerful hosting tools. This plan builds upon the Advantage plan, but with added eCommerce support so you can easily build an eCommerce site even without any programming skills. The Business plan is great for businesses with higher demands of hosting flexibility. Unfortunately, Netfirms does not provide Windows hosting, which means you need to look for a different hosting provider if you wish to start an ASP.Net website and use specific programming languages that’s only supported on the Windows OS. If you look at the features offered by this web host, you’ll notice that the plans are slightly scaled down compared to other plans offered by other providers. It’s a little sparse, but the capabilities are notable. These hosting plans are mixed bags, containing useful features but lacking others that usually come standard with other web hosts. There’s an integrated website builder that lets you build your site from scratch, but its functionality is limited. I do like the fact, though, that they include ad credits and one-click application installs. They even provide shared SSL certificates on all their shared hosting plans. If you need a dedicated SSL certificate, however, you need to sign up for the highest priced plan. Overall, Netfirms’ shared hosting plans are worth a look, but if you need more than the basic features and tools, you might want to consider checking out other alternatives, like iPage and eHost. Netfirms currently does not offer dedicated hosting, but they do have VPS hosting, which is a good option for those who have outgrown their shared hosting platform and need more resources and more powerful tools. You can choose from three different packages, with monthly pricing ranging from $33 per month to $100 per month. All three packages come with 2 dedicated IP addresses and varying amounts of disk space and bandwidth. These are offered through Netfirms’ partnership with Spry, a hosting company that allows unrestricted root access so you can easily configure your VPS to run however you like. And for an extra $10 per month, you can get a cPanel license, which will allow you to access their pre-installed cPanel OS template. It’s a wise investment for many users who want full control over their hosting platform. 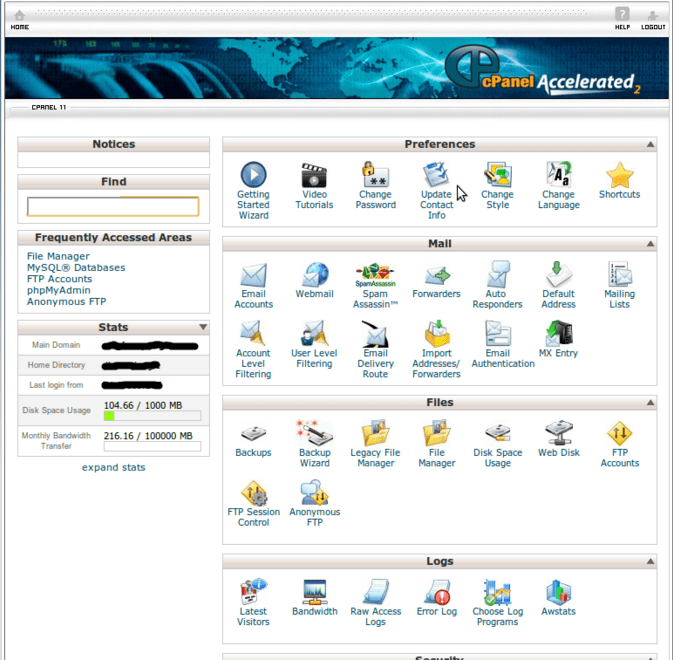 Take note, however, that cPanel is a standard feature in some web hosts, and that it’s already included in the package. Netfirms’ VPS hosting plans pale in comparison with other plans offered by top names like BlueHost. Not only are they more expensive, they’re slightly sparse in terms of features, too. And if you need more RAM, disk space, or bandwidth, you’ll have to pay an additional cost. The 2 dedicated IP addresses aside, there’s nothing quite appealing about their VPS hosting plans. Whether you’re looking to build a simple personal blog or a full-blown eCommerce site, WordPress hosting is the solution for you. Netfirms allow you to instantly create a free blog or website with WordPress, which is undoubtedly the best and most powerful blogging platform and CMS in the industry today. By choosing any of their hosting plans, you can install WordPress (and many other open source applications) with a single click. You can quickly and easily create and edit your WordPress website at any time, without touching a single line of code. Choose from hundreds of professional-looking design themes or pick a new look every week. You won’t even break a sweat updating your site whenever the mood strikes! For those who are expecting high traffic volumes to their site and need a more robust hosting package, you can opt for Netfirms’ managed WordPress hosting plan: WP Essential. At $3 a month, you can upgrade your plan and make WordPress hosting a lot easier. Take note, however, that this product requires an existing hosting plan. Faster websites. With a finely tuned SSD-based infrastructure and enhanced servers, WP Essential can speed up growing WordPress websites like yours. This means maximized uptime and front-end speed, and fewer customer on each server. High-level security. By teaming up with trusted security experts from SiteLock, WP Essential will add an extra layer of protection to your website by scanning it for malware, automatically eliminating any threats, and adding a firewall that secures your site against issues like comment spam. Support from WordPress experts. Need help with your WordPress site? No worries! With WP Essential, you’ll have access to a team of customer care agents who are trained in all things WordPress. You can reach them via a direct phone line so that you’re taken care of in a timely and professional manner. It’s definitely a worthy investment if you’re running a high-traffic WordPress site. Netfirms also offer Business Hosting, together with ShopSite. With these two combined, you’ll have everything you could possible need to get your online shop up and running fast. On top of these, you’ll have the most user-friendly and feature-rich eCommerce software in the market, forming an unbeatable duo that will leverage your online business. 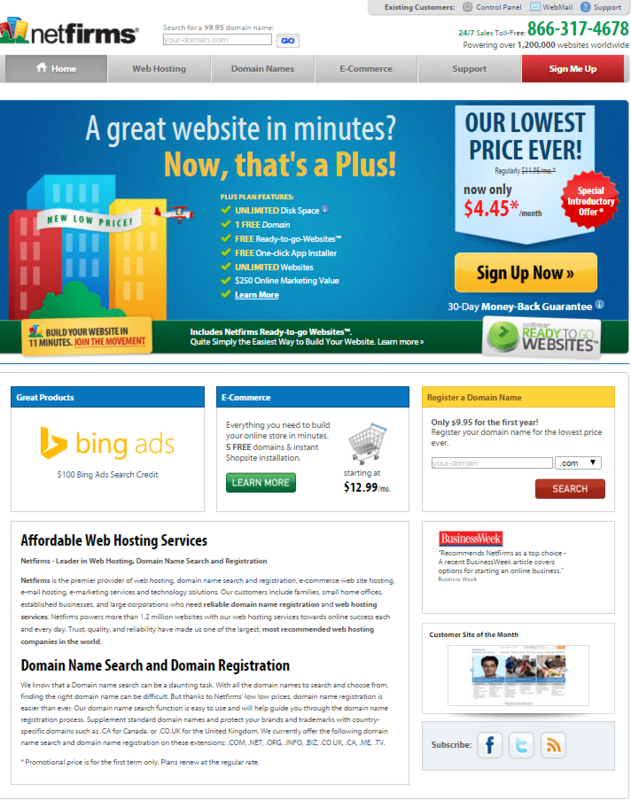 If you’re willing to shell out a few extra bucks, you can go for Business Hosting and ShopSite. It’s definitely a nice addition for those who want to build a more powerful eCommerce site for their business. But again, if you’re just planning to build a simple website or blog, you can get away with a shared hosting plan! 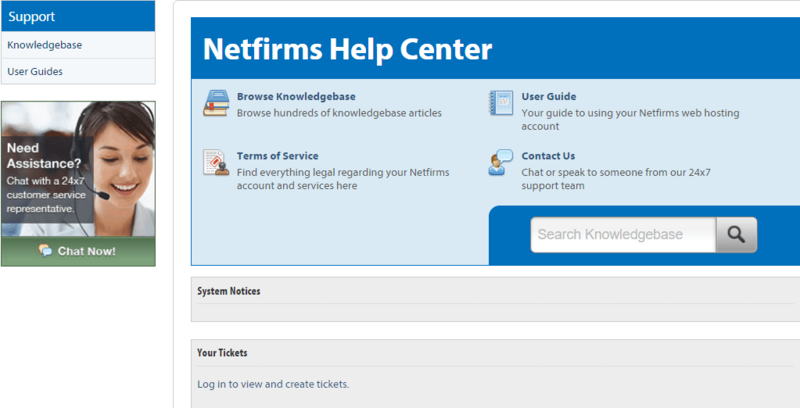 Clients at Netfirms will have access to tools and other options through a customized web-based control panel. This control panel is password-protected, and gives you access to an email account manager, domain name manager, advanced site statistics; and many other tools and features such as MySQL databases, bulletin board, etc. For an additional $10 a month, you can get the cPanel license and have access to Netfirms’ pre-installed cPanel OS template where you can have everything you need to start building your website. However, cPanel is only available with their VPS hosting plans. Forget the headache-inducing command-line administration and go straight to configuring your Apache and PHP installation with just a few simple clicks. Easily manage and configure your customers’ emails, FTP, and control panel access. With access to powerful web-based tools, you and your customers will be able to upload files, check emails, and generate useful site traffic reports. Protect your sites from spam email with SpamAssassin. That’s barely scratching the surface, though, because there are many other benefits you’ll get by purchasing a cPanel license. What’s not to love about this amazing control panel? As website owners who want to make the most out of our sites, we want it to be up and running 100% of the time – or at least as close to that figure as we can get. Based on my research, it doesn’t look like you’ll experience a lot of downtime with Netfirms. I didn’t see a trend where clients constantly complain about uptime, and the company even have a 99.9% uptime policy which they do seem to abide by. As you can see, they have 100% uptime for the past few weeks, which is quite impressive. And for this, I give them two thumbs way up! 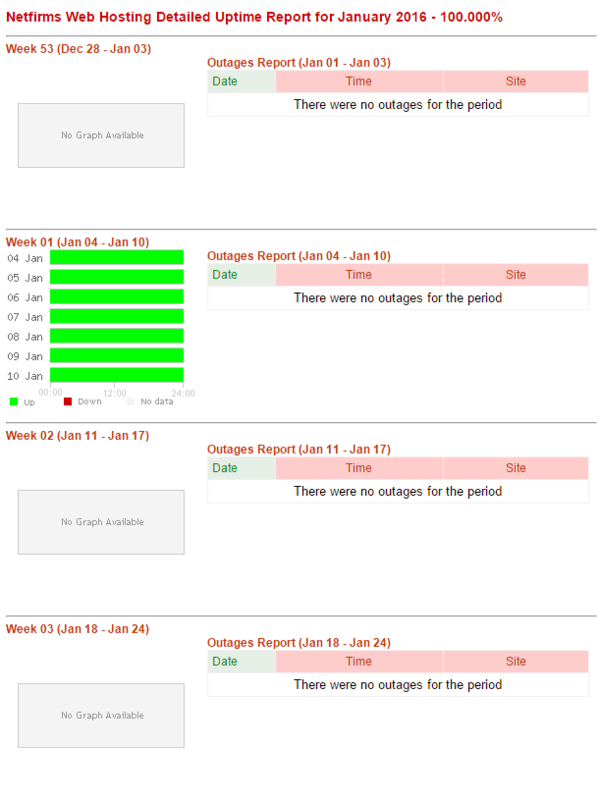 One thing that Netfirms really need to improve on, however, is their performance. It’s a huge setback for them to not offer SSD hosting, which is actually the way the web hosting industry has been going for many years. SSD hosting can significantly speed up your site’s performance so without SSD hosting, Netfirm’s overall performance is just average. It’s worth noting though, that this company have their own Tier 1 data center, with more than 40,000 servers housed within it. They are equipped with fully redundant power supplies and cooling systems which ensure stability with their hosted sites. Additionally, they have a cutting-edge data center that’s maintained and supervised by a team of expert IT professionals so you know you won’t have any issues with your website going down. Netfirm offers a standard 30-day money-back guarantee on all their hosting plans, although it’s only valid for credit card payments. And like other web hosts, if you register a free domain through them, there will be a non-refundable $15 fee if you wish to keep it. This fee covers their own costs and ensures that you can keep your domain even if you cancel your account with them. You’re free to transfer it to a different web host or simple point it elsewhere. For those who are on the lookout for better money-back guarantees, check out InMotion and Arvixe. InMotion offer a lengthy 90-day money-back guarantee, while Arvixe has a 60-day guarantee. Customer Support – Are They Available 24/7? Should you run into any technical issues, know that Netfirms is here to help you out 24 hours a day, 7 days a week. They provide decent help and support through various methods such as email, telephone, as well as trouble ticket submission. They even have a live chat system, which is the best way to reach a customer rep during emergencies. Additionally, they also have a help center where you can access an extensive knowledgebase that you can search by keyword; as well as a user guide with tips for using your hosting account. They even have a number of helpful text tutorials, as well as video tutorials. I went ahead and tested telephone support, and asked about their WordPress hosting platform. The average wait time was 6 minutes, and the customer rep was quick to answer my questions. He told me about their shared hosting plans and the benefits that come with them, and he didn’t even urge me to go for their higher priced plans. So no, they won’t bother you with constant upselling. Their live chat support, however, leaves something to be desired. I had to wait for about 12 minutes before somebody responded to my message. The average wait time between responses was a little over 6 minutes, which made me wonder whether or not their support staff is outsourced. On the upside, you can print your chat transcription once you’re done so you can refer to it later. Netfirms have certainly grown fast and strong through the years as they continue to serve up quality hosting services in the US and the rest of the world. They offer standard features, ample disk space and bandwidth, and many other features that you’ll find useful for building a powerful website or blog. It may not be the cheapest and faster web hosting service you’ll find in the market, but I’ll give them a thumbs-up in terms of reliability and performance. I especially like their easy-to-use and responsive customer support system, particularly with their telephone and email support. With years of experience in web hosting, they’ve certainly mastered the art of assisting their clients the best way possible. I’ve found their friendly and knowledgeable customer representatives to be among the best in the business. 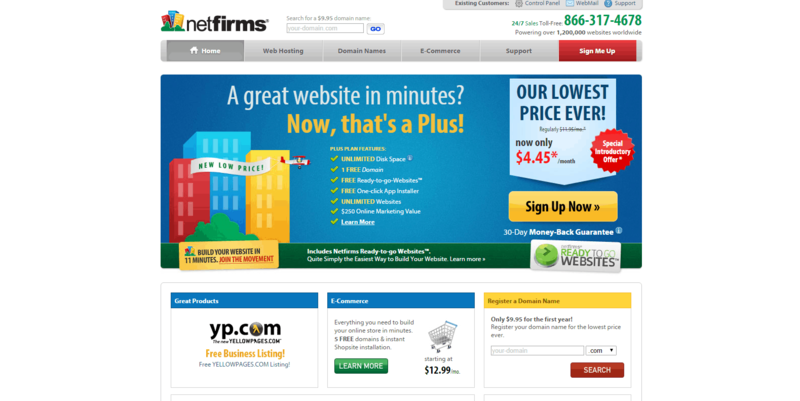 Overall, I found Netfirms to be something of a mixed bag. While there are a few minor issues with their practices that need to be addressed, they’re certainly a trustworthy, feature-rich, and moderately priced hosting provider with top-notch customer support that will appeal to many users, particularly among beginners and small business owners. An OK web host, with reliable hosting packages that are slightly on the higher end of the spectrum. Netfirms is a decent web host that’s ideal for those in need of basic web hosting, a reliable, excellent uptime, and customer support that can easily be reached at any time.